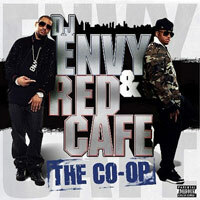 RapReviews.com Feature for October 30, 2007 - DJ Envy and Red Café's "The Co-Op"
Wikipedia defines a co-op (short for cooperative) as an “autonomous association of persons united voluntarily to meet their common economic, social, and cultural needs and aspirations through a jointly-owned and democratically-controlled enterprise.” I’ve mostly seen the model applied to health food stores and housing. Now DJ Envy and RED Café have applied it to hip hop. Or not. Other than the fact that this album is a cooperative effort between DJ Envy and Red Café, there isn’t anything here that has anything in common with whole foods or shared housing. Still, as a duo, Envy and Red work together nicely. Envy supplies a steady supply of glossy, New York beats for Red to work with. Standout tracks include the bumping synths of "What It Be Like," the 80s bounce of "What It Do," featuring a verse by Remy Martin, the reggae of "Ghetto Children," and the Neptunes-lite of "Dolla Bill." He also misfires a few times, like with the melodramatic synths on "Move Like A G" and the uber-cheesy "Shakedown 4 Life." Let it go like (Blau Blau Blau)"
The major problem with this album can be summed up by the skits, which chronicle the life and death of MC Death Murder Homicide, a rapper who comes off tough on his records but is in fact a total dork who loves Justin Timberlake. The first skit is funny, and I was thinking, “OK, Red Café is commenting about how wack gangsta rappers are, and how lame it is to rap about violence.” However, the Death Murder Homicide trilogy ends with the MC being killed by Red Café for lightly dissing him. I realized that what Red Café was REALLY trying to say with the skit is that phony myspace gangsta rappers are wack, because they don’t really come from the streets like he does. It’s an unconvincing argument, and makes for some unconvincing rhymes. "The Co-Op" has some good beats and some decent rhymes, but I think that Red Café can do better than this. I respect that he comes from the streets and wants to use that in his lyrics, but he needs to find a more original and creative way to leverage being shot and being in prison. As it stands on “The Co-Op.” he just sounds like a million other rappers doing the same thing, backed by beats that are good, but not good enough to truly stand out.